This product is from Vitamins, good for Energy, featured in the Essentials Range . 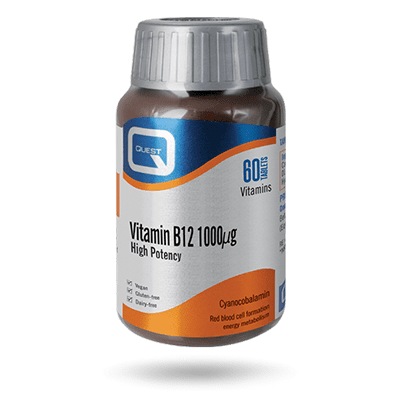 Vitamin B12 contributes to normal red blood cell formation, is involved in energy metabolism and plays a role in the reduction of tiredness and fatigue. It also helps to support the functioning of the immune and nervous systems. Stomach acid is needed to release vitamin B12 from foods so anyone with low stomach acid or who is taking antacid medication such as a proton pump inhibitor (PPI) should consider supplementation. Vitamin B12 is primarily found in animal derived foods so supplementation is also recommended for vegetarians and vegans to safe guard their intake of this important nutrient. Microcrystalline Cellulose, Dicalcium Phosphate Anhydrous, Vitamin B12 (1% triturate in DCP), Magnesium Stearate, Precipitated Silicon Dioxide.